In addition to well-known gaming notebooks, MSI also manufactures and mobile workstations, ie laptops, which are used as workstations. And in this case it is not just about workstations and graphics on mobile stations. To date, the company has a range of three line of mobile workstations: WS, WT and GT. In fact, mobile graphics stations differ from gaming laptops only in that they necessarily established professional discrete graphics card. In this article we will discuss top-end mobile graphics stations Series WS, namely the model MSI WS60 2OJ (3K IPS Edition). In WS series includes two models: MSI WS60 2OJ and MSI WS60 2OJ (3K IPS Edition) – which differ only in screen. In the case of MSI WS60 2OJ this 15-inch screen with a resolution of 1920 × 1080, and in the version MSI WS60 2OJ (3K IPS Edition) used a 15-inch IPS-screen with a resolution of 2880 × 1620. At the global website of MSI in the WS series includes also the model MSI WS60 2OJ (4K Edition)with a screen resolution of 3840 × 2160. However, the Russian site until mention of such a model is not in Russia, these models are not supplied. Thus, we consider in more detail the mobile station graphics MSI WS60 2OJ (3K IPS Edition), which is by far the thinnest mobile graphics workstations. Actually, picking and packing mobile graphics workstation MSI WS60 2OJ (3K IPS Edition) almost nothing (except the bonus software) does not differ from picking and packing gaming notebooks MSI. Laptop MSI WS60 2OJ (3K IPS Edition) comes packaged in two boxes. First – this is the usual dull cardboard box, which was immediately thrown out after removing it from the content. But the second box has been made of very strong black cardboard. Of course, the logos and lettering on this black box is a little different. So, instead of the dragon logo (logo game series notebooks MSI) has a logo mobile workstations MSI. And of course there is a sign advertising “Best Laptop for CAD & 3D Modeling” (the best laptop for CAD-applications and 3D-modeling). In addition to the laptop MSI WS60 2OJ (3K IPS Edition) The package includes a power adapter for 150 W (19.5; 7.7 A). 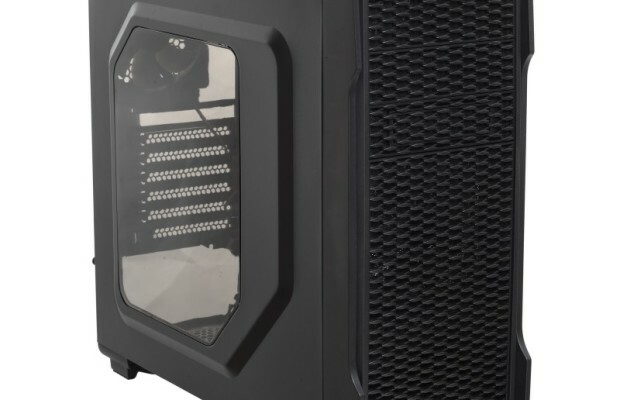 Based on the information on the manufacturer’s website , the configuration of the graphics station MSI WS60 2OJ (3K IPS Edition) can vary by a processor, memory, and storage subsystem. The video card is all the same: Nvidia Quadro K2100M with 2 GB of memory GDDR5. So, the foundation of our graphic station MSI WS60 2OJ (3K IPS Edition) is a quad-core Intel Core i7-4710HQ . 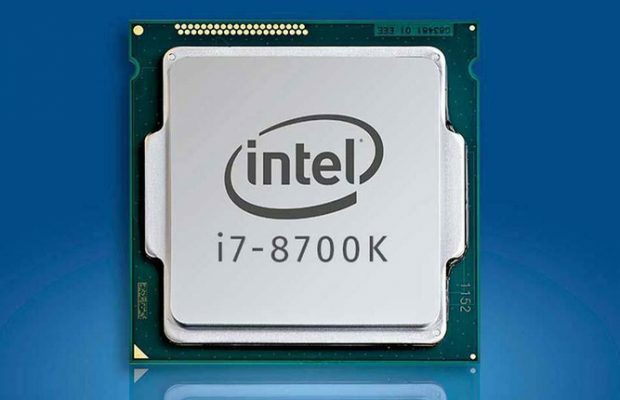 This processor has a nominal clock frequency of 2.5 GHz, which in Turbo Boost mode may be increased up to 3.5 GHz. 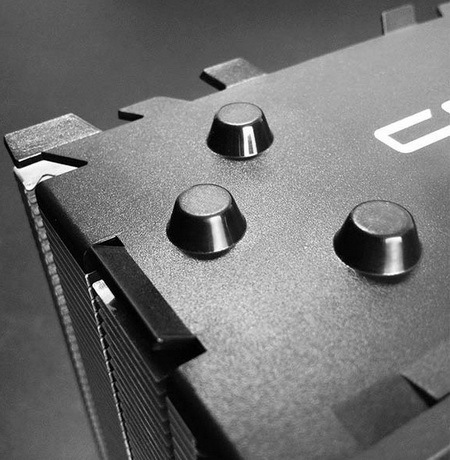 The size of its L3 cache is 6 MB, and the estimated maximum power – 47 Watts. In this CPU integrated graphics core Intel HD Graphics 4600, base frequency of 400 MHz, and the frequency mode Turbo Boost – 1,2 GHz. As already noted, the notebook MSI WS60 2OJ (3K IPS Edition) installed a discrete graphics card Nvidia Quadro K2100M with 2GB of video memory GDDR5. Actually, it is the presence of this video and distinguishes mobile graphics station MSI WS60 2OJ (3K IPS Edition) from a gaming notebook. And, of course, supported by technology Nvidia Optimus, which is responsible for switching between graphics core processor and discrete graphics depending on the application to run. 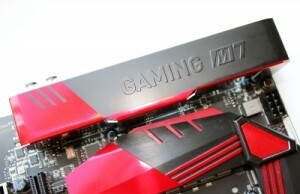 To install the SO-DIMM-memory modules MSI WS60 2OJ (3K IPS Edition) designed two slots. In our case, the laptop was equipped with two identical memory modules DDR3-1600, with a capacity of 8 GB each (SK Hynix HMT41GS6AFR8A-PB, timings 11-11-11-28), and, of course, the memory in dual-channel mode. However, it should be noted that self-replacing memory modules rather complicated procedure. It is not enough to remove the bottom panel of the notebook, because they themselves are slots for installing memory modules are from the motherboard, which is addressed not to the bottom of the enclosure, and the keyboard. Storage subsystem in this notebook called SuperRAID. It includes two SSD-drive Toshiba THNSNJ128G8NU capacity of 128 GB each, which are combined into RAID-0 array-level technology Intel RST. These SSD-drives are plug M.2. 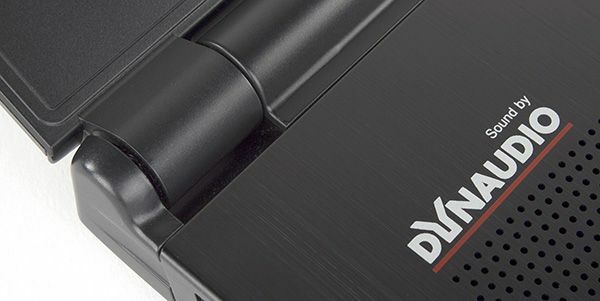 In addition, there is also a separate 2.5-inch HDD WDC WD10JPVX-22JC3T0, 1TB. It is clear that RAID-array installed operating system and all applications, and the HDD is used to store data. Making Connections are defined by the presence of a wireless network adapter Intel Dual Band Wireless-AC 7260 in support for 802.11b / g / n / ac and Bluetooth 4.0. True, we need to make an important remark. The fact that the MSI is still no resolution on the use of wireless adapters standard 802.11ac. And MSI notebooks are not equipped. We had an engineering sample notebook, well, the market will be supplied laptops MSI WS60 2OJ (3K IPS Edition), equipped with wireless adapters that support only standard 802.11b / g / n.
In addition, the laptop MSI WS60 2OJ (3K IPS Edition) has a gigabit network interface controller-based Intel I218-LM. 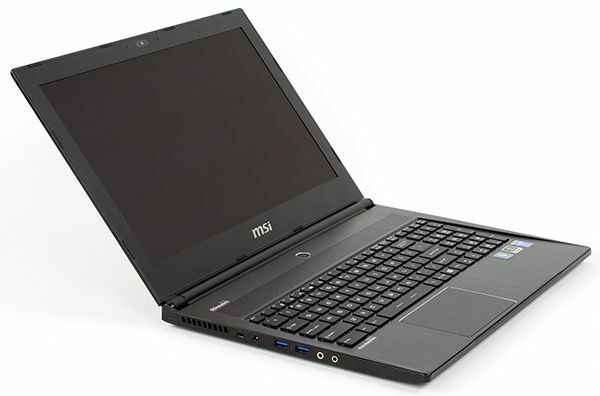 The audio subsystem notebook MSI WS60 2OJ (3K IPS Edition) is based on the HDA-codec Realtek ALC892. In the notebook has four speakers from the company Dynaudio, as well as two gold-plated audio jack minijack (microphone, headphones). It remains to add that the laptop MSI WS60 2OJ (3K IPS Edition) features a built-in webcam Full HD (1080p @ 30 fps), located above the screen, as well as non-removable 6-cell battery capacity of 4640 mAh (52.89 Wh h). 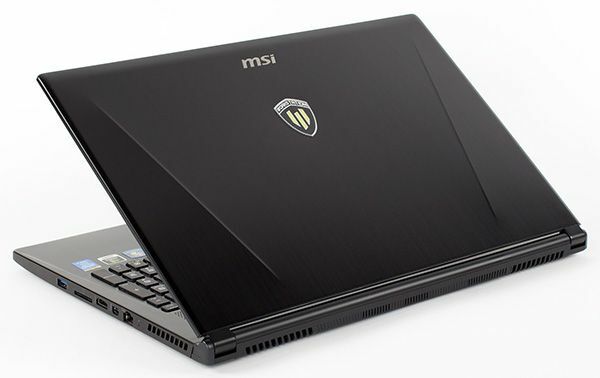 If we analyze the hardware configuration of the mobile graphics workstation MSI WS60 2OJ (3K IPS Edition), it becomes clear that it is practically identical to the configuration of the gaming notebook MSI GS60. Actually, the platform for MSI WS60 and MSI GS60 uses one and the same. The only difference is that in the gaming notebook uses a discrete graphics card games, well, in the form of mobile graphics workstation – professional graphics card. There is also a slight difference (other network adapters, a connector instead of Thunderbolt mini DisplayPort), but the platform is the same. Mobile graphic station MSI WS60 2OJ (3K IPS Edition) refers to a series of thin (slim) laptops MSI.And this is one of its main features. Indeed, the thickness of its shell is only 19.9 mm. Actually, the case of mobile graphics workstation MSI WS60 2OJ (3K IPS Edition) is no different from the case of a gaming notebook MSI GS60, which is natural, since the platform is the same. There are only minor differences in the finish. So, on the cover of the notebook instead of the logo in the shape of a shield with a dragon logo is used with the emblem of mobile workstations MSI. The notebook black and made of metal – magnesium alloy and lithium. Moreover, the metal is and the lower panel of the housing, and the work surface, and the top of the lid. Actually, from the traditional black plastic frame is made only of the screen. In the frame of the top-center of the screen is a webcam and two microphones tiny holes, and bottom – the traditional logo MSI. The fastening system laptop screen to the body is one hinge at the bottom of the screen. Hinge is stiff enough that allows to fix the screen in any position. This mounting system allows the screen to decline relative to the plane of the keyboard at an angle of about 150 °. The disadvantage is noted that when closing the screen is not fixed in any way (no magnetic latch). In addition, the screen does not have a rigid structure. He easily flex when you click on it with the side of the cover; it can be easily bent. However, this does not lead to the appearance of the characteristic spots on the screen at the point of application of force. 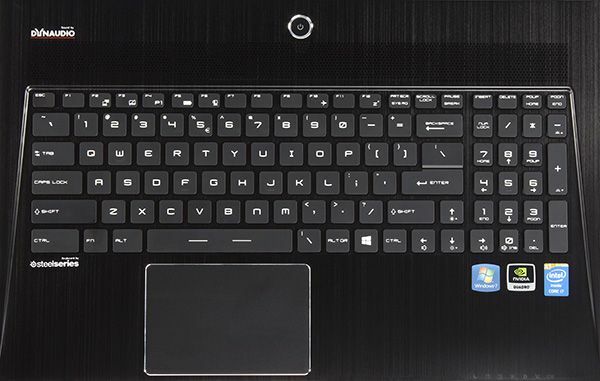 The keyboard on this laptop black; More about it, as well as about the touchpad, we will talk about later. Above the keyboard is located in the center of one single button on / off the notebook. And as with all laptops MSI, the power button can turn orange or white, depending on what kind of graphics card (or discrete processor) is used at a particular moment. LED status indicators are located on the right laptop on the front face of the housing. Total of seven indicators. On the left side of the case are two connector ports USB 3.0, two audio minijack type, power connector and a hole for a Kensington lock. On the right side of the case there is another port USB 3.0 (which supports charging of mobile gadgets off a laptop), a network RJ-45 connector, a slot for SD-memory cards, as well as HDMI and Thunderbolt 2.0. 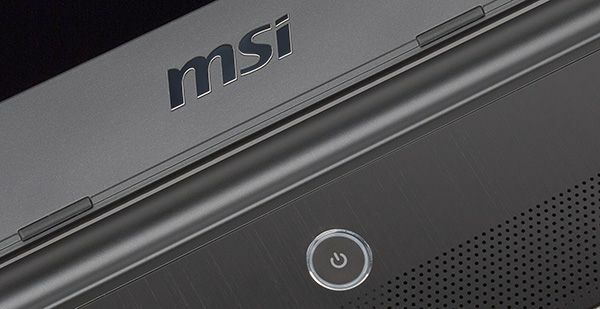 By the way, the connector Thunderbolt 2.0 is implemented in the form of mobile graphics workstation MSI WS60 2OJ (3K IPS Edition), and in gaming notebook MSI GS60 place it implemented Mini-DisplayPort. Note that the presence of ports and connectors HDMI 1.4 Thunderbolt 2.0 implemented in the graphic station MSI Matrix Display technology allows you to connect three external monitor and adjust the output image independently. Port Thunderbolt 2.0 can also connect one monitor c-resolution 4K. In the mobile graphics workstation MSI WS60 2OJ (3K IPS Edition) keypad is used, developed by the Danish company SteelSeries. This island-type keyboard with increased spacing between the keys.There is a separate numeric keypad NumPad. Generally, these keyboards are used on all gaming laptops MSI G-Series. But its use in mobile graphics workstation meaningless. The fact that the keyboard SteelSeries optimized to the needs of gamers. Optimization is that Windows key is not left as usual, and right. This is to ensure that accidental pressing this button during the game did not lead to such consequences as a way out of the game. In addition, the keyboard is backlit, the user can customize. However, instead of utility SteelSeries Engine, which in gaming laptops allows you to customize the keyboard backlight and record macros almost all of the keys is very convenient, especially if you’re a professional gamer in the mobile graphics workstation used utility Shortcut Manager. Another name, another interface, but the meaning is the same. This utility is designed to record a macro when a different sequence of keystrokes are assigned only one key. It is clear that in the version of the graphics station, all is not only meaningless, but also a disadvantage (lack of left key Windows – is the lack of). But, as we have said, for gaming laptops and mobile graphics station, MSI uses the same platform. And given the lack of keyboard – it’s a kind of payment for versatility. Keys on the keyboard have standard size (15 × 15 mm), and the surface is recessed slightly below the keyboard. Separate basis, the keyboard is not, simply recessed worktop made holes for each key. Can not say that at the base of the keyboard is very tough. The keyboard flexes when pressed, but the deflection quite insignificant and is not critical. The keys are soft, spring-loaded, quiet running and do not publish klatsat sound even when typing fast. In short, good quality keyboard. The notebook MSI WS60 2OJ (3K IPS Edition) used touchpad type klikpada with dimensions 105 × working area of ​​70 mm, which is enough for comfortable work. The sensitivity of the sensor surface is not satisfactory. Klikpad supports multitouch and very easy to use. The touch surface is slightly recessed, and is different in color from the rest of the working surface.Imitation clicking on the left button can be made in any field klikpada touch surface, which is very convenient. Also note that when using the mouse klikpad can be turned off using the control key, combined with the function key F3. Of course, if the graphic station is designed to work with CAD / CAM-applications, of course, sound system plays no role. But if graphic station is focused on working with video, the sound is important, however, than, for example, the color gamut of the screen. The audio subsystem notebook MSI WS60 2OJ (3K IPS Edition) is based on the NDA codec Realtek ALC892, but the notebook built four speakers. Subjectively, the acoustics in this notebook is excellent. The volume level is quite sufficient, and the sound quality will satisfy most users. But the audio path for connecting headphones, to put it mildly, a little disappointed. To estimate it, we resorted to the instrumental testing using an external sound card Creative E-MU 0204 USB and utility RightMark Audio Analyzer 6.3.0. Testing was conducted for stereo, 24-bit / 44.1 kHz.According to the results of testing the audio section was rated “very good”. A full report of the test results in the program RMAA 6.3.0 submitted on a separate page , the following is a brief report. The notebook MSI WS60 2OJ (3K IPS Edition) used IPS-matrix Panasonic VVX16T029D00 with LED backlight based on white LEDs. Diagonal matrix size is 15.6 inches, and its resolution of 2880 × 1620. Perhaps the only drawback of this matrix is ​​the fact that it has a glossy finish. For a gaming notebook – this is normal, but for a professional solution is a glossy display is not the best choice. Controls the brightness of the LCD matrix is ​​produced by varying the voltage on the LED backlight, ie, the matrix does not flicker for any level of brightness. According to our measurements, the maximum brightness of the screen on a white background is 310 cd / m². With a maximum brightness of the screen gamma value – 2.42. The minimum brightness of the screen on a white background is 35 cd / m². Color gamut LCD screen covers 90.6% of the space sRGB and 66,3% Adobe RGB, and the volume of the color gamut is 103.8% of the sRGB and 71.5% of the Adobe RGB. In principle, this is a very good result for the IPS-matrix. Filters LCD matrix spectra good share of primary colors. Thus, the spectrum of blue perfectly insulated and only the spectra of red and green colors a bit mixed, that is, in principle, it is typical for LCD matrices used in laptops. Color temperature of the LCD screen is stable throughout the grayscale (the dark areas can be neglected due to the measurement error), although a little understated. Its value is about 5800 K.
The fact that the color temperature slightly underestimated due to the fact that all of grayscale slightly reduced the proportion of blue (80% instead of 100%). As for color accuracy (delta E), its value does not exceed 6, the entire gray scale, which is a very good result for this class of displays. If we talk about the viewing angles of the screen, they can be considered excellent. Both horizontal and vertical. When you look at the image at an angle of almost no color distortion, and only very slightly reduced brightness. . Overall, I must say that the LCD screen in a laptop MSI WS60 2OJ (3K IPS Edition) is very good.And if he was still a matte finish, would do a great screen. In idle mode, as it should be, the frequency of the processor in a laptop is 800 MHz (of course, we are talking about a balanced pattern of energy consumption), ie the Intel SpeedStep technology no complaints there. The processor temperature in this mode is about 38 ° C.
When CPU test Stress CPU (utility AIDA64 Extreme Edition – test the stability of the system), which uses integer calculations, the frequency of the processor is 3.3 GHz (recall that for a processor Intel Core i7-4710HQ maximum frequency mode Intel Turbo Boost is 3 5 GHz). The temperature in this mode, the CPU load is increased to 76 ° C.
When the CPU load test Stress FPU, c which uses floating point calculations and heats mostly the processor, the maximum frequency of the CPU is 2.9 GHz, and its core temperature is raised to 89 ° C. In this mode, the load can be observed throttling. In general, it should be noted that the cooling system in the laptop MSI WS60 2OJ (3K IPS Edition), although cope with their tasks, but at the limit. In principle, that when stressful CPU throttling mode can be observed, there is nothing terrible. The main thing is that it does not affect the stability of, and reduction of the clock frequency of the processor when it is loaded stress – it is quite acceptable. According to the utility AIDA64 Cache & Memory Benchmark, the data writing speed to the memory of 25045 MB / s and a read speed – 24113MB / s. Memory DDR3-1600 (peak capacity of 12800 MB / s) in dual-channel mode is a very good result. As already mentioned, one of the features of the notebook MSI WS60 2OJ (3K IPS Edition) is its performance storage subsystem consisting of HDD-disk 1TB and two SSD-drives, combined into RAID-0 array level. For RAID-array utility ATTO Disk Benchmark determines the maximum speed sequential read and write at just over 1.0 GB / s. This is definitely a very good result, even for two SSD-drives, combined into RAID-0 array level. CrystalDiskMark utility determines the maximum sequential read speed at about the same level, but the speed of sequential write a little lower – at 760 MB / s. The difference in the readings of these utilities can be easily explained: the utility ATTO Disk Benchmark measures the speed at a depth of task queue (Queue Depth), equal to 4, and the utility CrystalDiskMark – at a depth of task queue of 1. Well, and also shows the results of testing RAID-array utility HD Tune Pro. It is clear that to make a slim notebook graphics performance station – this is a very difficult task, since it is necessary to create an effective system cooling for the processor and graphics card.Actually, for an effective cooling system in a laptop MSI WS60 2OJ (3K IPS Edition) used two coolers, one for video and one for the processor (as well as in gaming notebook MSI GS60. Given that the notebook is very thin, themselves coolers are also very subtle and effective they can only be due to the rapid rotation speed. And of course, it should affect the level of noise emitted by the laptop. Noise measurement was carried out in a special sound-absorbing chamber and sensitive microphone is positioned relative to the laptop to mimic typical user’s head position. According to our measurements, the idle noise level emitted by the laptop is 27 dBA. This low noise level, which can “hear” only in a quiet environment. But when stress CPU and GPU level of noise emitted by the laptop is increased to 42 dBA. This is already quite a lot, and at this level of noise notebook will stand out from the other devices are not even in a very quiet area. Traditionally, the measurement time of the laptop in standalone mode we spend on our technique using a script iXBT Battery Benchmark v.1.0 . However, in this case we have no ordinary laptop, and mobile graphics station, and measure the battery mode, for example, watch the video, it would, in our opinion, is incorrect. Therefore, we have slightly modified the procedure for measuring battery life. The first scenario – is a traditional mode of working with text and photo viewer. But instead of watching the video we used mode intensive calculations in the SolidWorks 2014 SP3 with the pact Flow Simulation (in more detail with this test can be found in our new testing methodology and workstations ). In this mode, at 100% load all the processor cores. The measurement of time we spent working laptop with the screen brightness of 100 cd / m². In addition, when working offline turns off the backlight of the keyboard. As you can see, while the off-line is quite small. However, this laptop is not focused on the use offline. This mobile graphic station is in the sense that it is simply easy and you can always take with you, but work with the mobile graphics station assumes a stationary place. To evaluate the performance of mobile graphics workstation MSI WS60 2OJ (3K IPS Edition), we used our new testing methodology workstations 2015 . Testing was conducted in the mode of connection to the network 220 and when fully charged. Actually, this is the first graphic station, we tested by this method. Recall that in our method as a reference workstation uses a system based on eight-processor Intel Core i7-5960X c 32GB DDR4-2133 memory and graphics card Nvidia Quadro K5200. Just recall that for the reference system used by the operating system Windows 8 (64-bit), and the mobile station graphics MSI WS60 2OJ (3K IPS Edition) tested under the operating system Windows 7 Professional (64 bit). Since our technique a lot of different tests, the detailed results of testing of mobile graphics workstation MSI WS60 2OJ (3K IPS Edition) and the reference system, we in absolute values, we carried on a separate page . Well, here we give only a brief normalized results in points iXBT a table and a chart (for clarity). Recall that for the reference system of the normalized results of each test are taken for 100 points iXBT. Thus, the results of testing of mobile graphics workstation MSI WS60 2OJ (3K IPS Edition) to the following conclusions. This notebook is very good screen (it is a pity that it is not matte), good sound system, easy to operate the touchpad (though, of course, when you use the notebook as a workstation to him still have to connect a mouse). As disadvantages can be noted the high level of noise caused by high CPU and video card, as well as extremely short battery life. 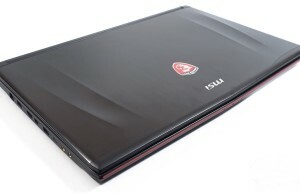 If we talk about the positioning of mobile graphics workstation MSI WS60 2OJ (3K IPS Edition), we would recommend using it for applications in which productivity is largely dependent on the performance of the processor and the storage subsystem – and to a lesser extent on the performance of the graphics card. So, MSI WS60 2OJ (3K IPS Edition) is quite suitable for use in Adobe Premiere Pro CC 2014, Adobe After Effects CC 2014, Adobe Photoshop CC 2014, Photodex ProShow Producer 6.0.3410, for payments in SolidWorks 2014. Moreover, it can be recommend and for three-dimensional modeling programs such as Autodesk 3ds max 2015 SP1 and Autodesk Maya 2015. In conclusion, we note that the warranty on the mobile workstation MSI WS60 2OJ (3K IPS Edition) is 3 years.